Global UX: Design and Research in a Connected World discusses how user experience (UX) practice is changing and how practitioners and teams around the world are creating great user experiences for a global context. The book is based on interviews with practitioners from many countries, working on different types of projects. It looks behind the scenes at what it takes to create a user experience that can work across borders, cultures, and languages. The book begins with a quick look at the world outside of UX. This includes the external forces of change and globalization as well as an overview of how culture affects designers and the UX of products. It considers what global UX means for an individual practitioner, a company, and teams. It then turns to the details of global UX with the process and practice of research in the field; how information is brought home and shared with colleagues; and how it is applied in design. The final chapter presents some thoughts about how to deliver value both to projects and the users of finished products. Whitney is a user experience researcher and usability expert with a passion for clear communication. Her projects include work for the National Cancer Institute (US), The Open University (UK) and IEEE (worldwide). She enjoys learning about people and using those insights to products where people matter. Pursuing her interest in the usability of civic life, she has served on two US government advisory committees: updating US “Section 508” accessibility regulations and creating standards US elections. She was president of the Usability Professionals’ Association (UPA) International, on the board of the Center for Plain Language, and is a Fellow of the Society for Technical Communications. Whitney is the author, with Kevin Brooks of Storytelling for User Experience: Crafting stories for better design (Rosenfeld Media, 2010). She’s also proud that her chapter “Dimensions of Usability” in Content and Complexity turns up on so many course reading lists. Daniel is Principal Consultant at Apogee, a usability consulting Services Company based in Hong Kong. 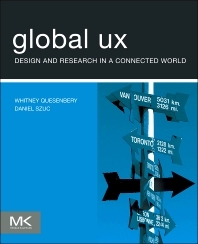 "In these pages the reader quickly gains an understanding of the intricacies, importance and excitement in global UX. Whitney Quesenbery and Daniel Szuc have delivered a fabulous mix of experienced global voices that we all can take on the challenging and rewarding journey of (literally) making the world a little easier, a little safer, and little more fun." --Robert M. Schumacher, Ph.D., Managing Director, User Centric, Inc.
"For designers and software architects, this volume on user interface design provides a discussion of practical and theoretical concerns surrounding the development of user experiences in computer software. Not designed to provide coding specifics, and language and platform agnostic, the work looks at key features of interface design from the generalized perspective of software design, development, and production. Topics discussed include culture and user interface design, strategies for global companies and products, field research, and planning for globalization." --Reference and Research Book News, Inc.